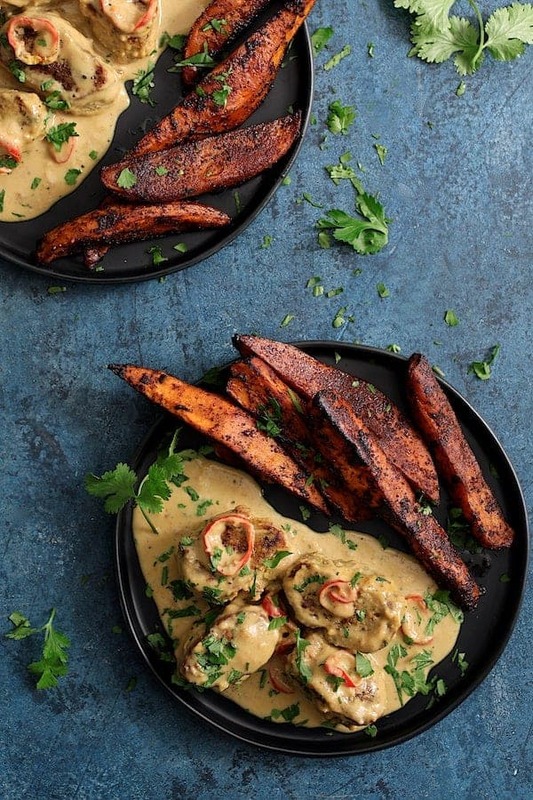 Spicy Tahini Pork Medallions with Harissa Roasted Sweet Potato Wedges is a super-tasty dinner for two! You’ll enjoy making this spicy, flavorful dish for that special someone and it’s also the perfect easy dinner you can make together! It’s so good, my husband practically licked his plate! In Sunday’s Taste Matters, I shared Dorie Greenspan’s new cookbook, Everyday Dorie, as my current cookbook crush! Here is a spin on one of the recipes from that book. 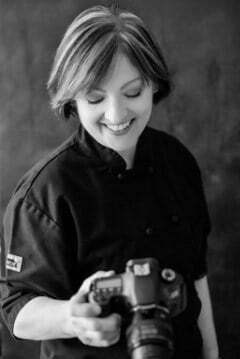 I’m truly crazy about her new cookbook! There are so many recipes that sound like they rock with flavor and are so simple! 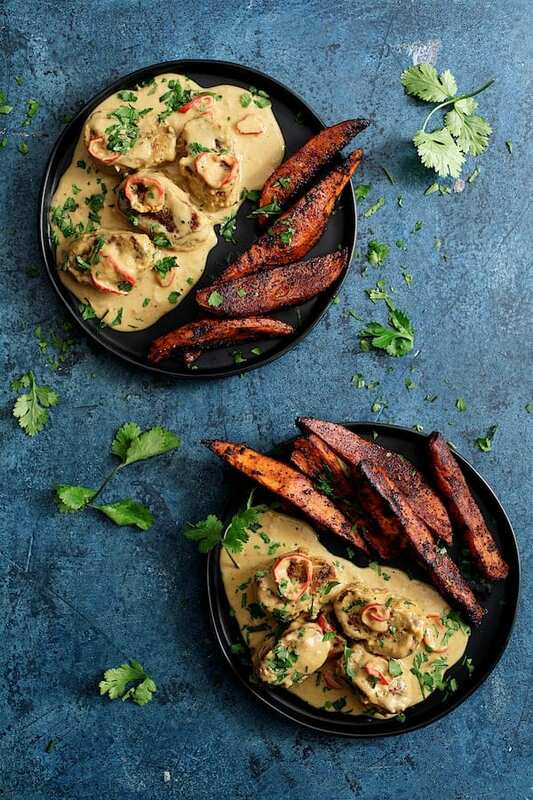 This Spicy Tahini Pork Medallions with Harissa Roasted Sweet Potatoes is inspired by one of the recipes in her cookbook: Lightning Fast Tahini Pork. 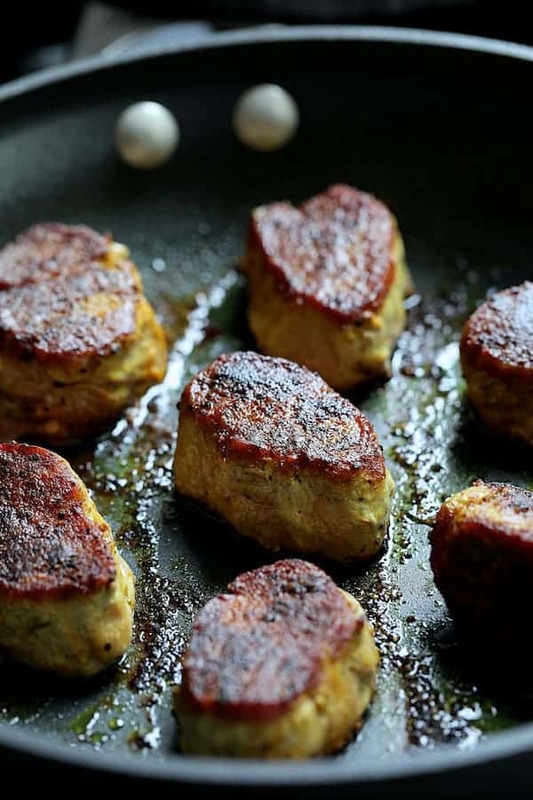 Dorie’s recipe for the Lightning Fast Tahini Pork calls for putting a dry harissa spice blend in with the spice combination that dusts the pork. I only had a harissa paste on hand. So, instead of using it on the pork, I used it on sweet potatoes to serve on the side. A little cayenne pepper worked perfectly instead in the spice blend. Dorie’s recipe calls for cutting the pork tenderloin into chunks, but I prefer to cut it into medallions. I find it easier to get them all cooked properly than with chunks. Start by prepping the sweet potatoes. Peel and cut into wedges. Toss with harissa paste, olive oil, salt and pepper then spread out on a baking sheet. Now, the harissa paste looks dark and foreboding, but trust me! It’s really that color because of the chile peppers that are in it. 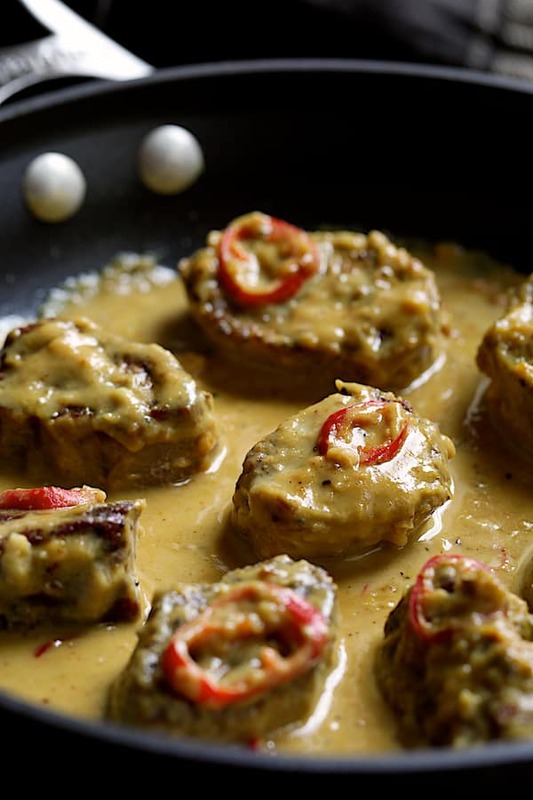 Bake while making the Spicy Tahini Pork Medallions. Start by trimming and prepping the pork tenderloin. With a pork tenderloin (not to be confused with a pork loin which is a completely different cut) be sure to remove the silverskin which is a tough membrane and very visible. Then give it a good sear on both sides in olive oil…. 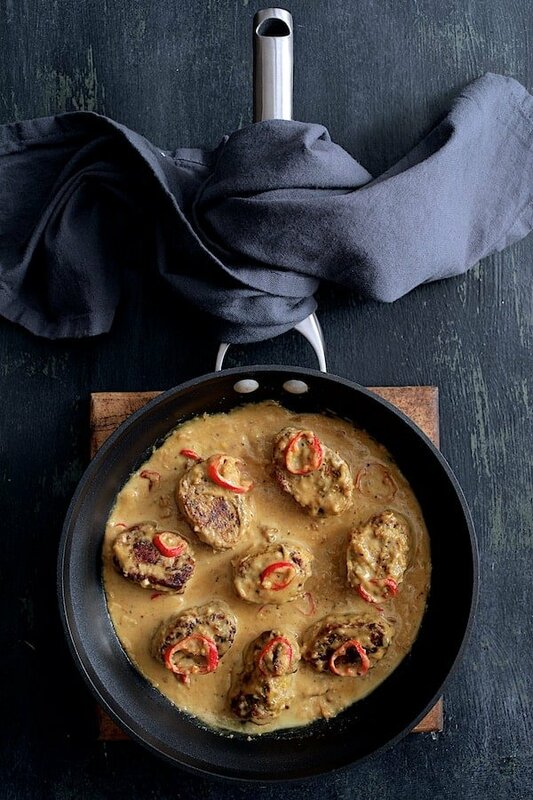 Add the tahini sauce combination and simmer away until the medallions are cooked through and the sauce has thickened. Your loved one is going to be looking over your shoulder on this one eager to dig in! 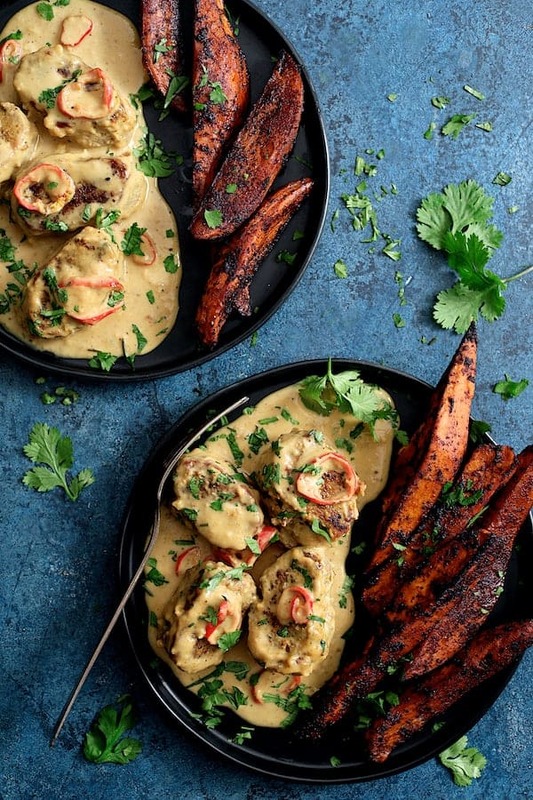 Spicy Tahini Pork Medallions with Harissa Roasted Sweet Potato Wedges is a super-tasty dinner for two! You'll enjoy making this spicy, flavorful dish for that special someone and it's also the perfect easy dinner you can make together! It's so good, my husband practically licked his plate! POTATOES: Preheat oven to 375 degrees. 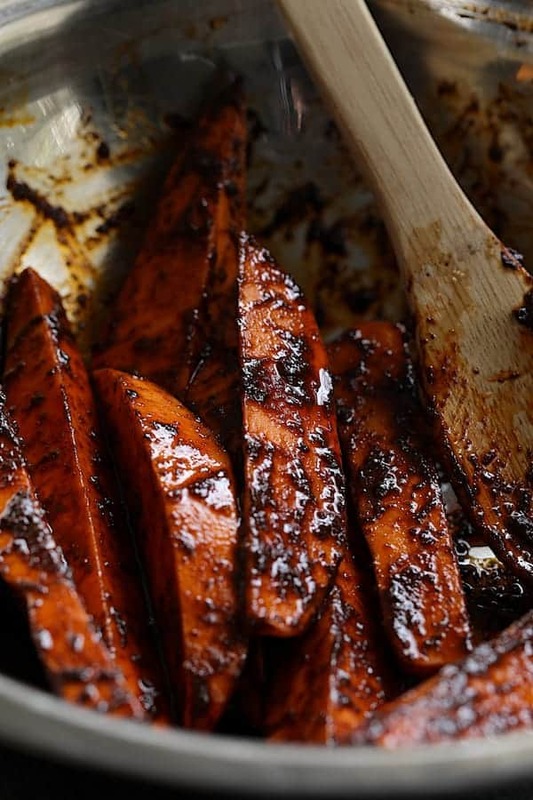 Combine sweet potatoes, olive oil, harissa paste and salt and black pepper to taste in a bowl. Toss well so that the potatoes are well-covered with the ingredients. Spread out onto a nonstick baking sheet or line one with nonstick aluminum foil. 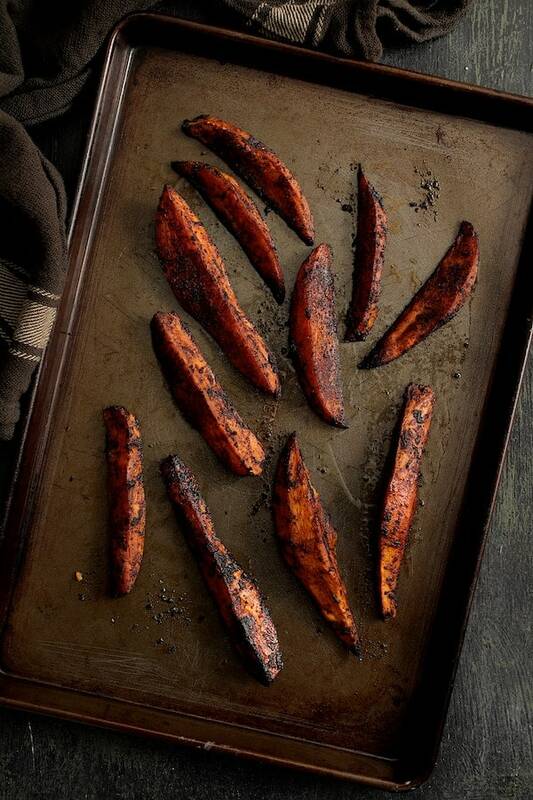 Spread the potato wedges out on the baking sheet and place in the oven. Bake 15 minutes. Turn over and bake another 10-12 minutes or until wedges are crispy on the outside and tender on the inside. SAUCE: Combine all the sauce ingredients in a small bowl. Set aside. 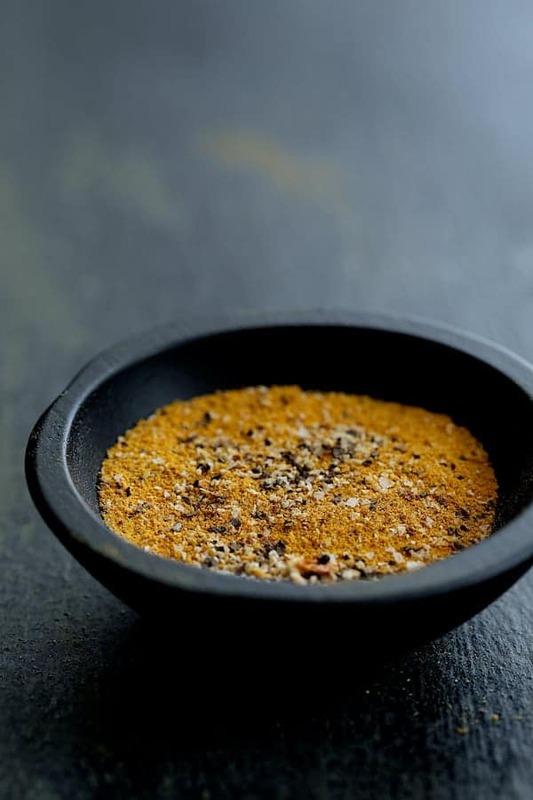 SPICE RUB: Combine all the spice rub ingredients in a small bowl. 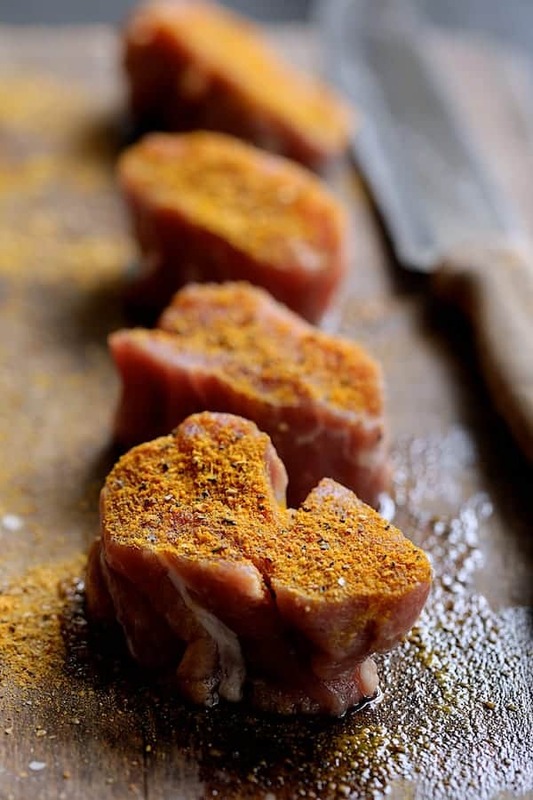 PORK: Coat the pork tenderloin medallions with as much of the spice rub as possible, paying most attention to the top and bottom of the medallion as that's the part that will be seared. Heat olive oil in a nonstick pan or skillet over medium-high heat. 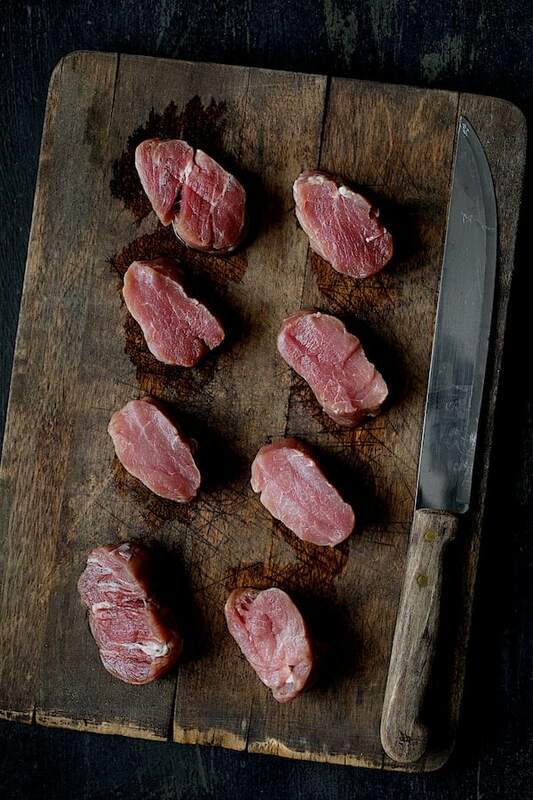 Add the pork medallions, reduce heat to medium and cook 3-4 minutes per side. Add the Fresno chile and sauce. Simmer, reducing heat to low (the sauce will thicken!) as needed until the pork medallions are cooked through to at least 145 degrees in the center. Turn the pork once while simmering and add a tablespoon or two of water if needed. Serve pork with potatoes garnished with fresh cilantro and with yogurt as needed. Firstly your photos made me really hungry. I have never tried the spice rub mixture before. I think I will try it on over the weekend. Thank you for sharing. Thanks, Amita! Hope you enjoy and thanks so much for the kind words!